So, although I’m not a fan of candy or sweets I have come to terms with using them as a bargaining tool. I’m struggling with the introduction to salads. I started cutting up cucumber, carrot, tomato and red pepper chunks. I’ve placed them on her plate on a regular basis for the past three months or so. 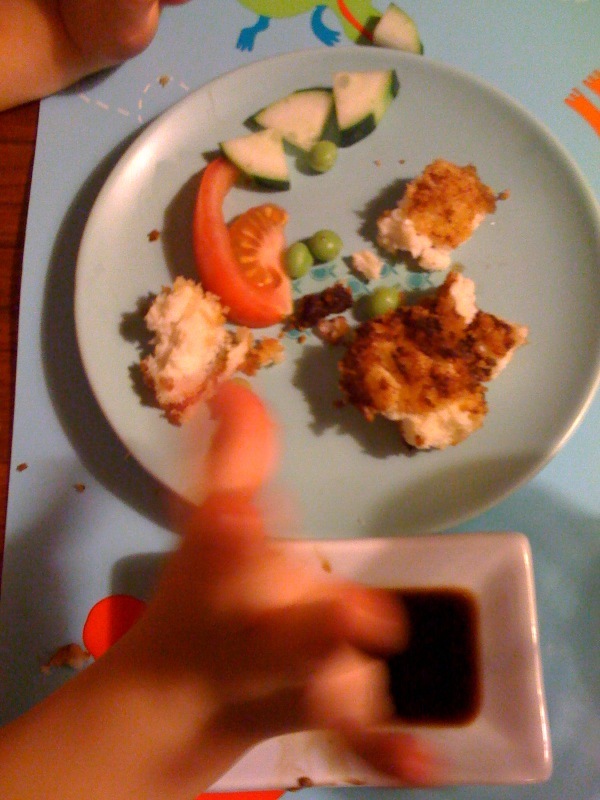 I have to encourage her to eat her veggies and I usually end up negotiating down to half of what I served. And if they are served without balsamic vinegar forget it. Recently I came across the power of dessert. She will eat a quarter veggie sandwich and a cut up kid version of a salad(meaning chunks of lots of veggies) without much fuss as long as I have a yummy looking dessert in front of her. And only a quarter of the dessert does the trick. Tonight I served cauliflower cheese balls that look more like chicken nuggets with cucumber, peas and tomatoes. All gone along with a quarter, mini cheesecake.